Apparently the shortsighted “strategy” of San Diego Unified School District Superintendent Cindy Marten to address the $124 million dollar deficit is to allow our students and staff to risk their health, their learning and their site security. 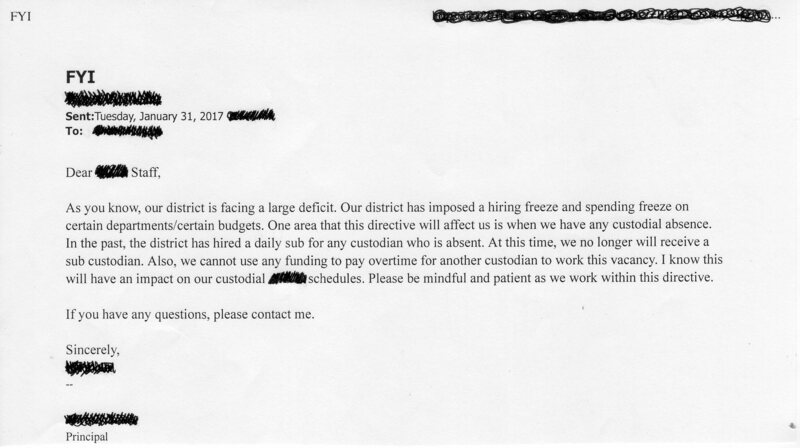 According to the following email from a SDUSD Principal to site staff, the “district” (née Cindy Marten) has “imposed a hiring freeze and spending freeze in certain departments“ including Custodial Services that denies Custodian substitutes or overtime to make up for absentees. District Deeds has received a WHISTLEBLOWER Report from a committed, highly experienced individual who is deeply concerned about the repercussions of this decision. I am a custodian who has years of experience within the San Diego Unified School District (SDUSD). Based on my custodial job experience and what I learned as a union steward investigating SDUSD negligence regarding its handling of custodial issues, I have some unique information and insights pertaining to SDUSD’s cuts to the custodial budget and how such cuts will detrimentally impact the health and safety of students, staff and site visitors of all schools within the District. There are cleaning tasks that need to be performed on a daily basis to maintain basic human sanitation and safety needs. ALL restrooms and eating areas have been designated by the District to be cleaned and supplied DAILY. The District has designated trash to be dumped daily for the same reasons. Just ignoring these tasks for even ONE day can lead to serious health and safety concerns. For example, if restrooms aren’t cleaned and mopped daily, students and staff return to restrooms the following day covered in human waste potentially ladened with diseases. Eating areas can be ladened with disease-carrying human waste as well as trash and food. Trash, food, and human waste can within hours of exposure attract disease-carrying pests such as rats and cockroaches which can eat such waste, produce their own disease carry waste, multiply, and further infest schools as vectors for even more disease. In my many years as a custodian, I have seen how filthy classrooms can become when they are cleaned on the District’s standard first, second, or third day cleaning schedule. I have witnessed classroom floors in just 1-2 days after cleaning being so covered in pencils, crayons, and other forms of litter that you could barely see the floor underneath. I have seen classroom sinks so covered in the same amount of time in paint, glue, glitter, and pencil shavings that you could barely see the sink underneath. And don’t get me started on schools that participate in the ‘Breakfast In The Classroom’ program. The tables and floors of these classrooms have milk, jelly, and other food items smeared on them on a daily basis. It is hard to keep up with a thorough cleaning of the food spills and waste on a “1, 2, or 3” day scheduled cleaning basis LET ALONE IF THESE ROOMS MISS THEIR CLEANING DAY BECAUSE THE DISTRICT WON’T PROVIDE COVERAGE FOR AN ABSENT CUSTODIAN! BY THE WAY, IF THE DISTRICT DEEMS EATING AREAS AS REQUIRING DAILY CLEANING, WHY DOESN’T THE DISTRICT PROVIDE THE CUSTODIAL STAFFING AND RESOURCES TO INSURE “BREAKFAST-IN-THE-CLASSROOM” CLASSROOMS ARE CLEANED EVERYDAY AS WELL? b.) To serve as a First Responder in case of an emergency for all after-school students and staff (especially those present for after-school programs such as the Prime-time day care program). In addition to the three points above, I learned as a job steward that a great deal of schools are not providing custodial coverage for after-normal-school-hours programs such as Saturday School and many sports events. In many years and site visits of experience I learned the horrors of not providing such coverage. 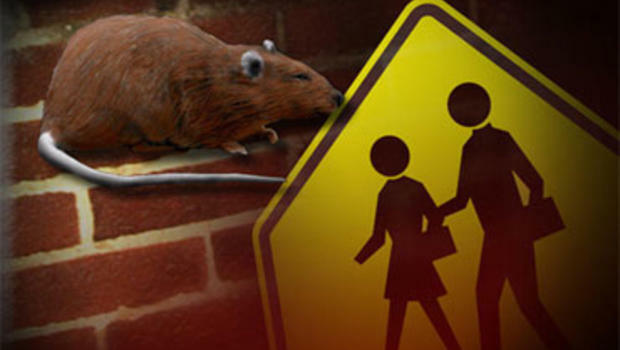 I learned of such horrors as unemptied trash and human waste attracting animals that would leave their droppings all over campus the following regular school day to the disgust and health risk of students and staff alike. All the same horrors stated above would only increase and magnify if the District discontinues providing substitute custodial coverage as well. I also learned from my SDUSD experience in general the horrors of how District management unfairly and cruelly, in violation of state and federal laws, punishes the custodians themselves for being absent rather than accepting blame for their irresponsible, unethical, disastrous, and illegal custodial cost-cutting policies. Recently, District management have been disciplining custodians for being absent, even when they have doctor’s notes stating they cannot work the days they were absent due illness or injury. This is illegal in clear violation of both the federal Family Medical Leave Act (FMLA) and the California Fair Employment And Housing Act (FEHA). District Deeds agrees with Custodial Crusader…and so should all SDUSD Stakeholders, especially the School Site Staff and Students who may get sick or risk danger due to this short-sighted, short staffing. It is unjust, unfair and potentially illegal for the Marten Administration to force Custodians to do make up the work of an absent colleague and then punish them after they get injured or sick, with proof from a doctor, for doing so. While on the SDUSD Custodial Tiger Team, we learned that every site Custodial headcount has an hours required formula for keeping the school site safe and clean. It is a formula that accounts for virtually every minute of every Custodian…there is no “over staffing” allowed and every Custodian is vital to preventing disease and infestation and ensuring site security. Supervise the custodial and related services in the assigned area of the school district to ensure facilities are maintained in a condition of operating excellence and full educational use; supervise assigned personnel – SDUSD Custodial Services Supervisor “Basic Function. Many SDUSD Schools, especially Elementary Schools, have only one Custodian assigned. It is impossible to “supervise assigned personnel” if they are absent and there is no substitute. It is also impossible to prevent the risks described by Custodial Crusader with no Custodian and no substitute. Are rat “droppings” and cockroaches in desks and carpeting “operating excellence and full educational use”? Is the risking of Student and Staff lives through poor or no security “operating excellence and full educational use”? Do any of these risks ensure “Safe and well-maintained facilities” as part of the 12 Indicators of a Quality School in the SDUSD Vision 2020. Superintendent Cindy Marten and Board of Education Trustees Barrera, Beiser, Evans, McQuary and Payne are responsible for this looming disaster and SDUSD Stakeholders should hold them accountable for doing so. The Superintendent and Board of Education must FULLY staff custodial support before the death or illness of one Student or Staff becomes a reality. The Superintendent and Board of Education must act NOW! Is CASSAS / Saturday School going to have a custodian? Several schools have a school day on Saturdays (which must be voluntary and cannot be used for punitive reason to include making up tardies). What is the policy for custodians for CASSAS? coverage was simply not necessary. perform any necessary custodial work. Also, I learned that some schools were having students attend Saturday School because they were absent from school for many days.